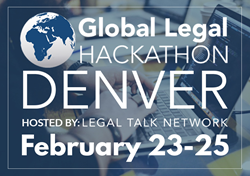 Legal Talk Network has been selected as Denver’s host location for the Global Legal Hackathon on February 23-25, 2018. This event will be a platform to showcase the best minds in law and technology from Denver, Boulder and the Colorado Front Range. Legal Talk Network, the largest producer of legal-related podcasts, will be the Denver host for the Global Legal Hackathon, a worldwide event occurring over the weekend of February 23-25, 2018. The Global Legal Hackathon will bring together representatives from the world’s largest law firms, corporations, and tech innovators for the rapid development of tech solutions that improve the business and practice of law or accessibility to legal services. Based on its commitment to legal innovation, Legal Talk Network was chosen as a host location for the inaugural hackathon, along with over 40 other locations across 20 countries spanning 6 continents. “We are blown away with how this event is coming together globally, with stakeholders spanning the entire legal industry, from private to public. There’s sure to be an equally diverse range of ideas and solutions that get developed over the hackathon weekend,” said David Fisher, Co Founder of the Global Legal Hackathon, CEO, Integra Ledger. Some of the biggest names in law and technology are involved as either sponsors or hosts including Thomson Reuters, Wolters Kluwer, Microsoft, IBM, Orrick, not to mention law schools, non-profits and law firms. At each location, teams of individuals will spend the weekend of February 23 - 25 ideating and developing tech solutions that impact the practice, business and delivery of legal services. The doors for the Denver venue located at 3120 Blake Street opens at 4pm on Friday, February 23rd. Hacking begins at 6pm that evening and goes until judging on Sunday night. The winner from Denver will go on to compete in the second round on March 26th. Finalists from the second round will be invited to the Hackathon award banquet in New York City. The global winner will be announced April 21. The Global Blockchain Summit, a gathering of blockchain experts from around the country to be held in Denver in April, will serve as the co-host along with Legal Talk Network. For more details and information on participating, mentoring, volunteering or sponsoring, please visit the event page on LegalTalkNetwork.com. The Global Legal Hackathon engages law schools, law firms and in-house departments, legal technology companies, governments and service providers to the legal industry – across the globe. It will bring together the best thinkers, doers and practitioners in law in support of a unified vision: rapid development of solutions to improve the legal industry, world-wide. Participants from all backgrounds and industries are welcome to join the Global Legal Hackathon, including law firm partners and associates, in-house counsel, IT professionals, entrepreneurs, students and tech innovators both inside and outside of the legal industries. To learn more about participating in the Global Legal Hackathon, visit globallegalhackathon.com. Contact info@globallegalhackathon.com for media inquiries. Legal Talk Network is a podcast network that specializes in creating content centered around the law. It features hosts from well-known organizations and brands in legal, including the American Bar Association, Thomson Reuters, The Florida Bar, Robert Half Legal, Above the Law and Northwestern Pritzker School of Law. The network has more than 20 active podcasts that cover industry trends and events, important legal news and developments, including access to justice, law school, legal technology and the future of law.